For the same levels of economic attainment, minorities are still living, separately, in poorer communities. Want to see what segregation looks like in America today? Take a drive on New York's Long Island, one of the most racially segregated portions of the country. I grew up there, and the differences between adjacent white and minority towns can be so sharp it's as if invisible fences divide them. Two villages, Hempstead and Garden City, lie adjacent to one another in Nassau County. Hempstead has a medium household income of $52,000. Garden City's is $150,000. Hempstead, in parts, resembles an inner city — with bodegas, laundromats, low-rise apartment buildings. Garden City is a suburban idyll, with tree-lined streets, gourmet grocery stores, and large colonial-style homes. Garden City is 88 percent white; Hempstead is 92 percent black and Hispanic (split about evenly). The transition between the two villages occurs within one block, a visual whiplash. See for yourself. Travel up North Franklin Street on Google maps. "Long Island is becoming more diverse, Nassau County is becoming more diverse," says John Logan, a Brown University sociologist who has been studying demographics since the 1970s. "But within Nassau County there's been hardly any change in the degree of segregation. The predominantly minority areas are becoming more minority. And the predominantly white areas are staying mostly white." That demographic story of Nassau County, Long Island, is the story of the nation's suburbs at large. Zoom way out, and it looks like the suburbs are becoming more diverse — a welcomed reversal of the racist housing policies of the last century that kept minorities in the cities. But zoom in, block by block, and you see that within those suburbs, stark segregational divides like the one between Hempstead and Garden City still exist. "Blacks and Hispanics who earn over $75,000 a year live in areas with higher poverty rates than whites who make less than $40,000." The divide exists in the Washington metro area, where Maryland's Prince George's County is 64 percent black and Virginia's Arlington County is 71 percent white (and with a median household income $30,000 greater than Prince George's). It exists in the St. Louis suburbs, and has underlined the tensions which erupted there over the summer following Michael Brown's death in Ferguson. Across the country, communities adjacent to one another — one largely minority and one largely white — paint the suburban sprawl with stark gradients of inequality. Recently, Logan published Separate and Unequal in Suburbia, a concise (for an academic paper) explanation of how the suburbs are becoming more diverse and unequal at the same time. It used to be the thinking in sociology that as minority groups gain income, they'd gain access to better suburban communities. Logan's starkest conclusion is that they are not. Here's the one data point to make that case: When Logan controls for income, he finds that blacks and Hispanics who earn over $75,000 a year live in areas with higher poverty rates than whites who make less than $40,000. A good way to evaluate these neighborhoods is to look at the elementary schools, which often represent a sub-community of a larger school district. Overall, suburban schools are academically better than city schools. But white suburban schools are better than black and Hispanic suburban schools. "The average black or Hispanic elementary school student attends a school that ranks below the 45th percentile in the state," Logan writes in his paper. The average white student in the suburbs? They attend schools that score above the 60th percentile. Again, Long Island lends a dramatic example. There, the percentage of schools that instruct mostly minority students has more than doubled in the last 20 years, according to a report out of the University of California (Los Angeles). The percent of intensely segregated schools — school where less than 10 percent of the students are white — has increased as well, from 4 percent to 11 percent from 1989 to 2010. Black and Latino students attend school with nearly triple the percentage of low-income peers than typical white and Asian students. What's true of the schools is true of many of the resources in black suburbs: They are objectively better than those in the city. Poverty rates and crime rates are lower in these communities. "There are reasons why you would move to a predominantly black suburb as opposed to staying in the predominantly black, or black and Hispanic, inner-city poor neighborhood — it's a step forward," he says. But that does not make up for the fact that, by many measures, blacks and whites are living in different worlds. "I think that's the underlying situation that then becomes the basis for frustration and anger when something happens to spark it," he says. There has been progress. Black/white segregation has been declining over the years. 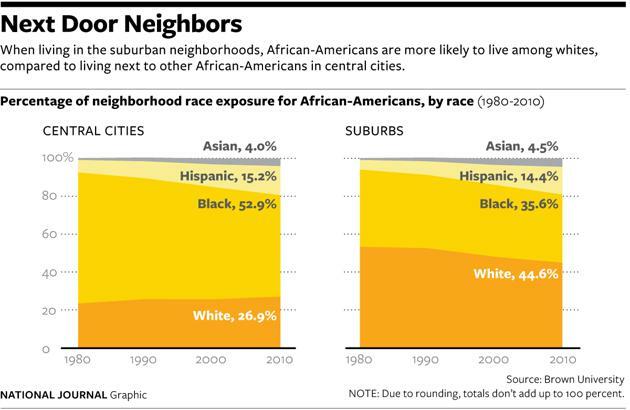 In 1980, fewer than 6 million blacks lived in the suburbs. Now 16 million do. These numbers are more dramatic for Asians and Hispanics. In solidly middle-class neighborhoods, Logan finds, whites won't leave when minorities move in, like they might have in previous decades. But that is mostly occurring in places with already good public resources. 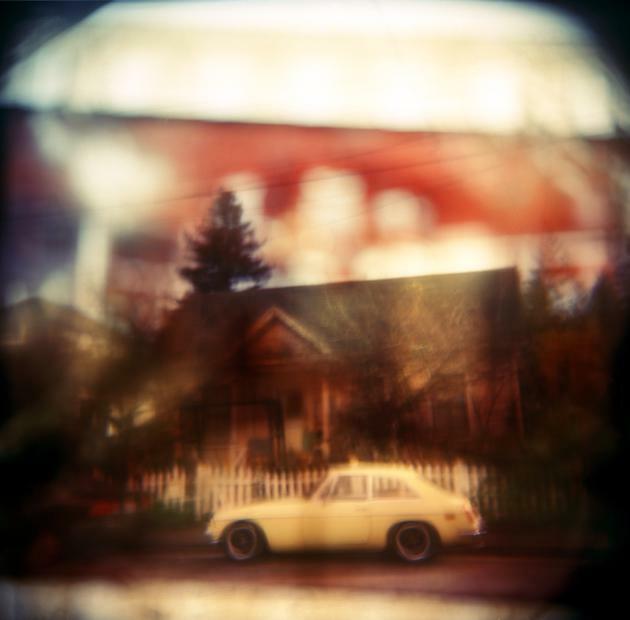 The suburbs are a cornerstone of the American dream. But, for right now, the realization of that dream looks very different in black and white.